So you've been tasked with starting up a fitness challenge or you are trying to come up with some ideas to spice up your current competition beyond the typical weight loss or pedometer challenge. Don't get me wrong, weight loss and walking competitions can be very effective, it's just that your challenge ideas can be as broad as your imagination so why not explore the alternatives and variations. As mentioned above, the two most common challenge modes are weight loss and pedometer / walking. While there is a good reason that they are the most common, primarily ease of administration and assumed effectiveness, they may not always be the best choice. For example, a weight loss challenge will disenfranchise a large portion of your workforce that might not have much weight to lose but are still unhealthy. Likewise, a pedometer challenge will allow more employees to participate but most will lose motivation after the first few competitions when distance runners habitually win. An activity challenge is a good compromise that asks employees to record the time spent performing their daily physical activities. The time is then submitted to the challenge administrator at regular intervals. It is generally a good idea to set guidelines and examples of activities such as: time spend in the gym, performing housework, gardening, or actively playing with kids. Yes, employees are on the honor system here but trust is a big part of any challenge regardless of mode. Another effective mode and one of my personal favorites is a daily checklist challenge. In this challenge, participants are given a list of healthy activities they are to perform on a daily basis such as: drinking 8 glasses or water, performing 20 minutes of cardio, taking the stairs instead of the elevator, etc. These checklists are then submitted to the challenge administrator at regular intervals where they receive points for each activity. The great thing about this challenge mode is that it teaches healthy lifestyle choices while encouraging employees to adopt them. It can also remain fresh by periodically changing the required checklist activities. So you want to run a "Biggest Loser" style weight loss competition but need to improve participation rates with a pedometer challenge. No problem - do both. A multi-mode challenge combines several competitions together either simultaneously or back-to-back. By doing so, you create a larger challenge that brings out the positives of one challenge mode while mitigating the negatives of another. Since you will have two very different sets of data in a multi-mode challenge, you need to assign points to each challenge. For instance, you can assign 10 points for each pound lost and 0.0001 points for each step taken. Since 10,000 steps are roughly five miles, you are equating losing one pound to walking five miles. It may take a little trial and error to get the numbers right, but this challenge type can be very effective and it evens the playing field for participants of all fitness levels. Even after you select the mode for your fitness challenge, you need to decide whether you want to run an individual or competitive challenge. An individual challenge has employees working toward reaching a set goal while a competitive challenge pits employees against one another for progressive awards. Each type of goal has its benefits and shortfalls. A typical individual challenge will require that each participant reach a certain goal to receive an award such as losing ten pounds or logging 50 hours of physical activity. Since every participant can be a winner, awards are generally smaller than with a competitive challenge. However, effort is more likely to remain constant since high-performing employees cannot run away with the challenge making it impossible for others to win. Since tiered awards are given based on the order in which participants finish, competitive challenges allow administrators to offer larger prizes to the winners thereby generating more interest among participants. Another benefit is that competitive challenges are not self-limiting meaning that participants do not stop participating after a set goal is reached. They can also be used effectively with teams which can enhance participation and promote camaraderie. The correct perspective is important when putting together a employee fitness challenge. For that reason, you might consider a fitness challenge to be the corporate equivalent to a diet discussed on TV or found in a magazine. The diet is laid out to take place over a certain period of time and, if followed correctly, may possibly generate positive results. Unfortunately, whatever weight is lost from the diet is usually put back on over the ensuing weeks. The typical fitness challenge follows the same formula; a challenge is put in place which participants followed closely while goals are achieved. Sounds great except that, like a diet, most participants drift back into their old habits quickly after the challenge concludes. So, the problem is that fitness challenges are similar to dieting. The good news is that the solution is found in dieting as well... almost. Any dietitian will tell you that dieting is not the answer but that a proper diet is. A diet is not something that starts and stops. A diet is a lifestyle choice and something that goes on indefinitely. 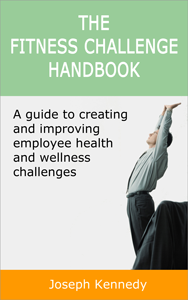 In the same way, fitness challenges should be viewed as an ongoing aspect of an employee wellness program. But, like a diet, challenges need to be varied and appeal to a wide variety of employees to remain fresh. While a particular challenge should only last a few months to keep employees engaged, additional challenges could be joined together back-to-back as in the multi-mode challenge mentioned above. When running challenge cycles, considering switching the modes and goals from one cycle to the next to keep the program fresh and interesting. If you run a weight-loss individual challenge one cycle, switch to a competitive walking challenge with teams the next. I hope these employee fitness challenge ideas have been helpful. For further reading, please see The Fitness Challenge Handbook for expanded coverage on these issues and much more. Alternately, you may sign up for a free ChallengeRunner account and recieve the eBook free of charge! All of the ideas discussed above and many additional variations can be implemented inexpensively using the ChallengeRunner.com system.